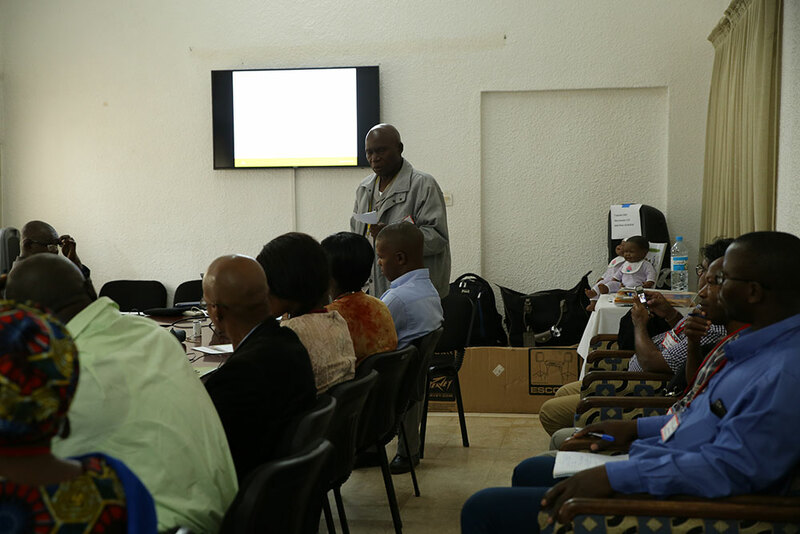 In July 2017, SPRING/Guinea hosted an event to share the program’s accomplishments in promoting improved nutrition practices in Guinea. 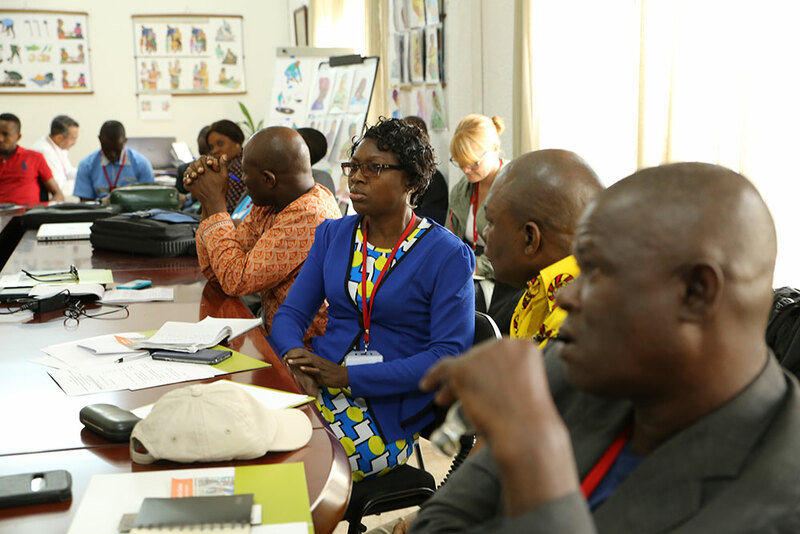 Key partners, including the Ministry of Agriculture, UNICEF, PSI, and PLAN International were in attendance. 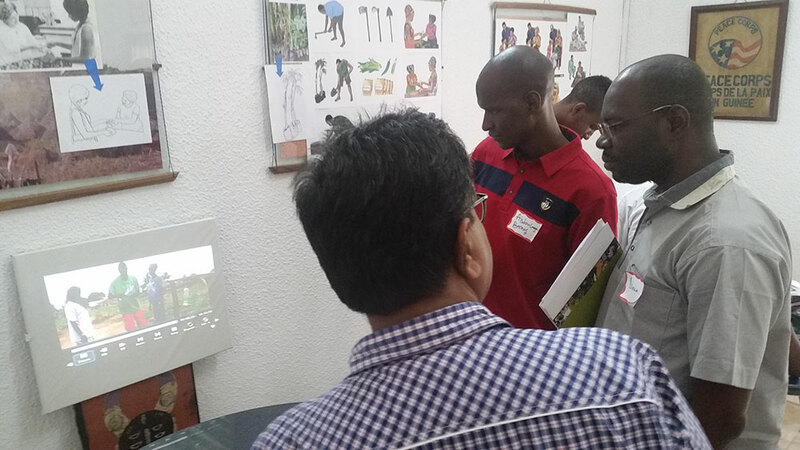 After presentations on community radio, community video, and the photo-to-illustration process, there was an interactive “show and tell” session where the partners were able to see some of the tools used for these techniques. 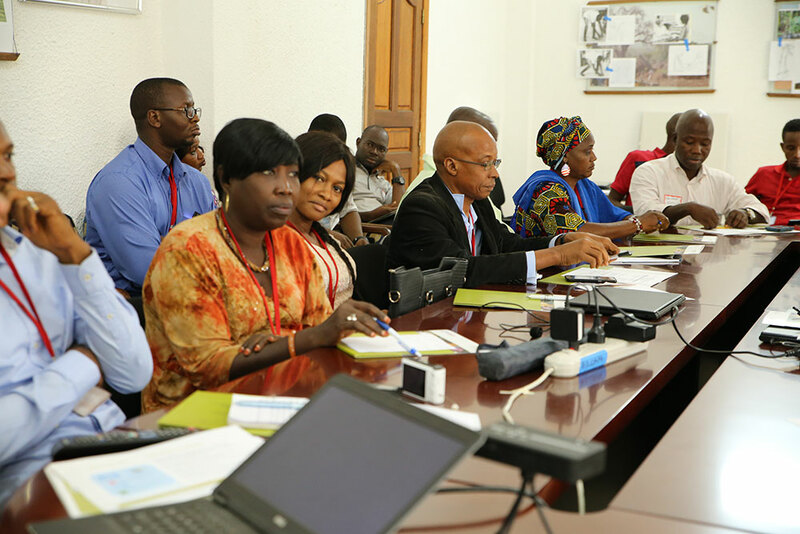 In order to promote continued use of the local capacity that SPRING has developed over the course of the Guinea project, partners received lists with contact information for SPRING resources in Guinea. 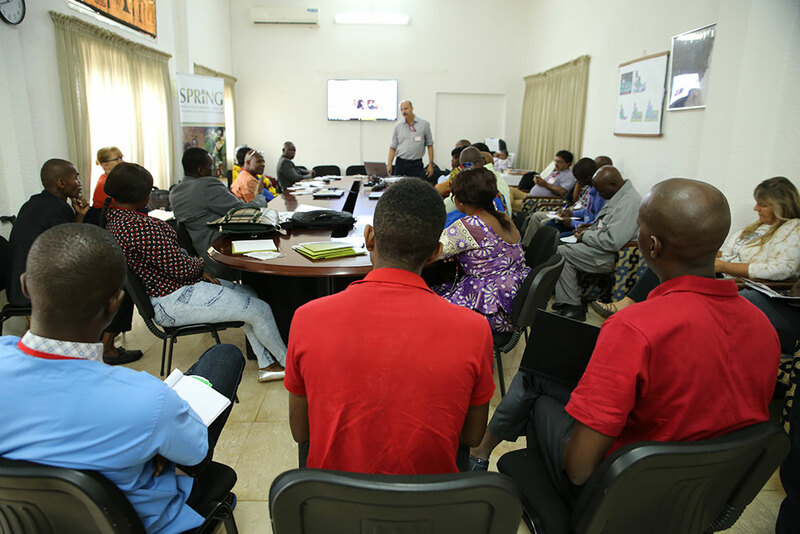 SPRING SBCC Technical Advisor Phil Moses answers questions on SPRING’s community video work in Guinea. 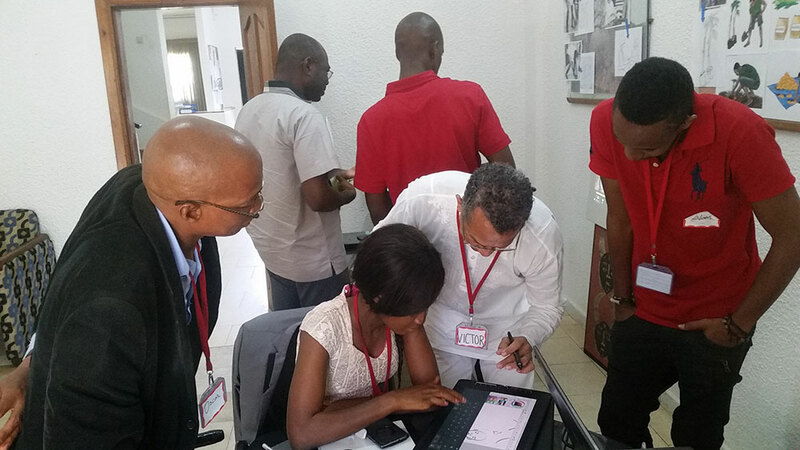 Leaders of local artists’ cooperative “Bulle d’encre” (“Ink Bubble”) Youssouf Ben Barry Oscar and Aïssatou Kâdè Balde and participants in the photo-to-illustration workshop explain to partners how to contact the cooperative to take advantage of photo-to-illustration services now being offered in Conakry. 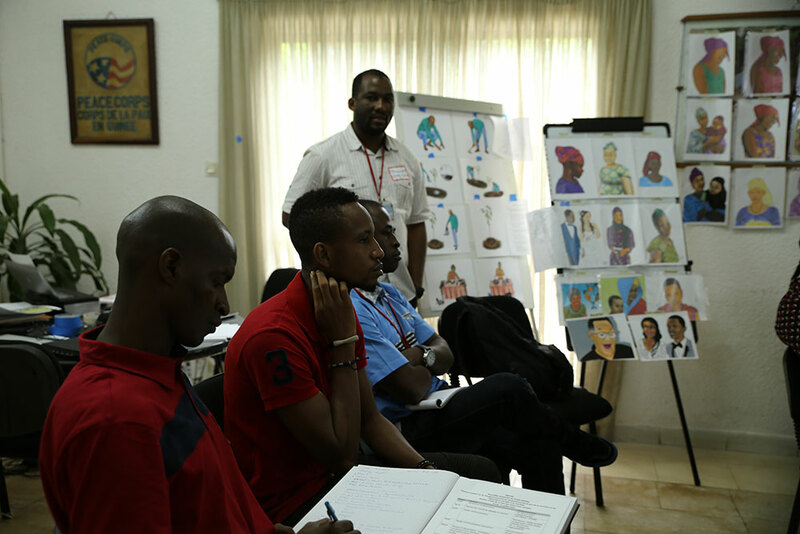 Local artist cooperative members Youssouf Ben Barry Oscar and Aïssatou Kâdè Balde demonstrate new skills to partners. 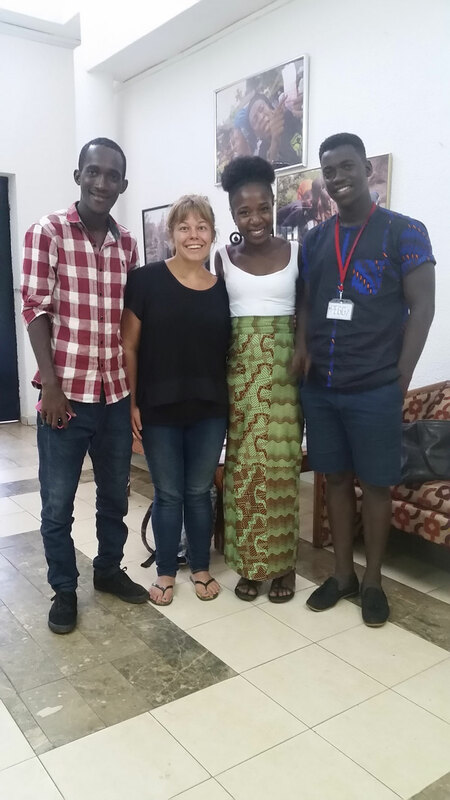 Digital Green's Dr. Nadagouda shares community video details to U.S. Peace Corps Guinea staff members N'Tossama Diarra and Dr Abdoulaye Barry. 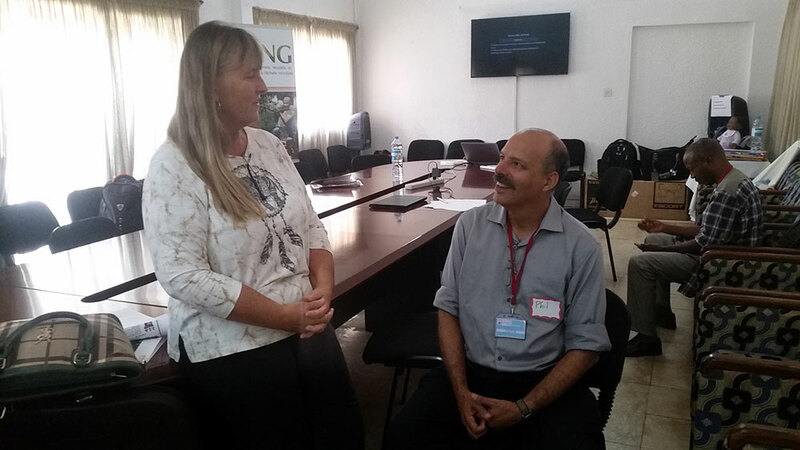 Peace Corps Guinea's Director or Programming and Training Susanne Krasberg and SPRING SBCC Technical Advisor Phil Moses discuss next steps. 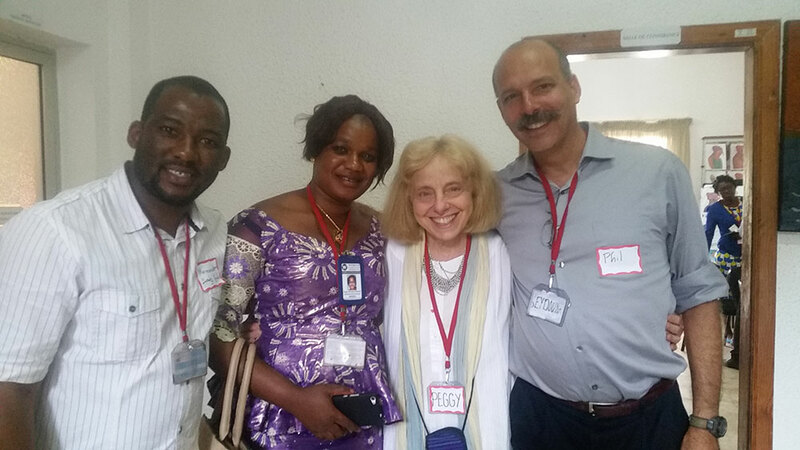 Phil Moses and Peggy Koniz-Booher from the SPRING SBCC team congratulate SPRING/Guinea staff Mamadou Hady Diallo and Hadja Mariama Konaté. 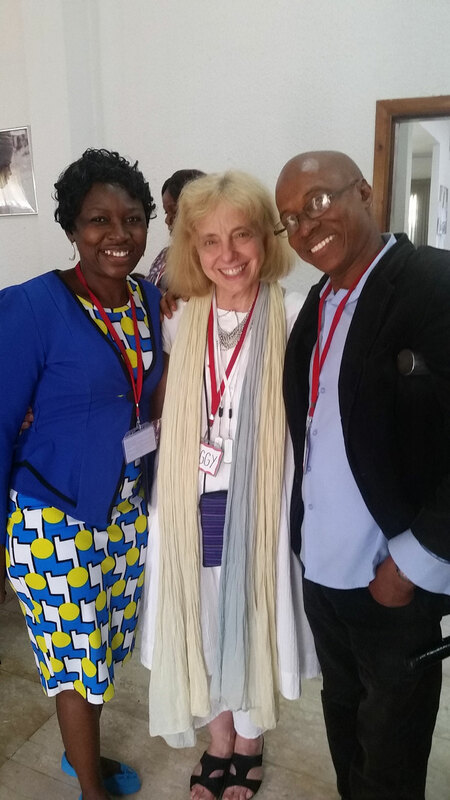 Peggy Koniz-Booher (SPRING) poses with UNICEF C4D Officer Miracle Korkalo Saoromou and Photo-to-Illustration training participant Youssouf Ben Barry Oscar from the local artist cooperative “Bulle d’encre." Photo-to-Illustration training participant Kate Hendrickson (Peace Corps Volunteer) and her counterparts at a rural coffee cooperative pose while discussing how to use illustrations in their training materials for members. 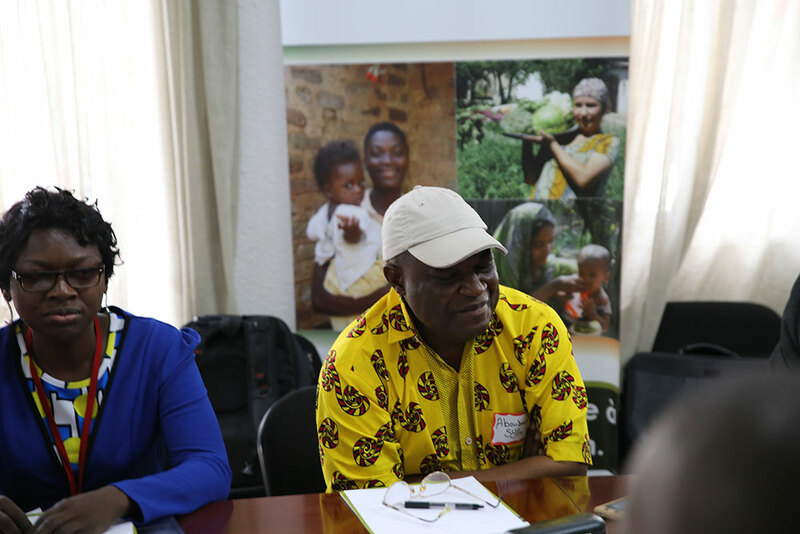 Aboubacar Sylla of Radio Rurale Guinée had many questions about SPRING and Farm Radio International’s work in Interactive Community Video in Faranah and Mamou. 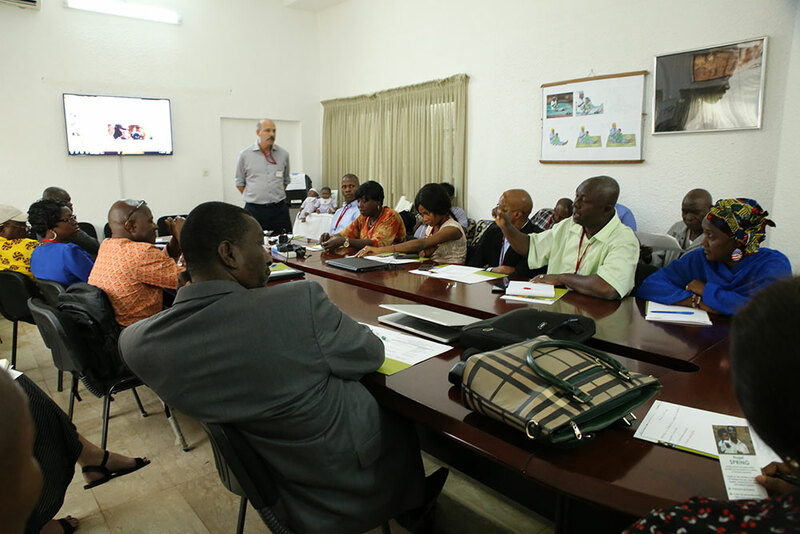 Ibrahima Yansané from the Ministry of Agriculture’s Chief of Extension Services emphasizes the importance of having well-designed extension programs to use community video effectively. 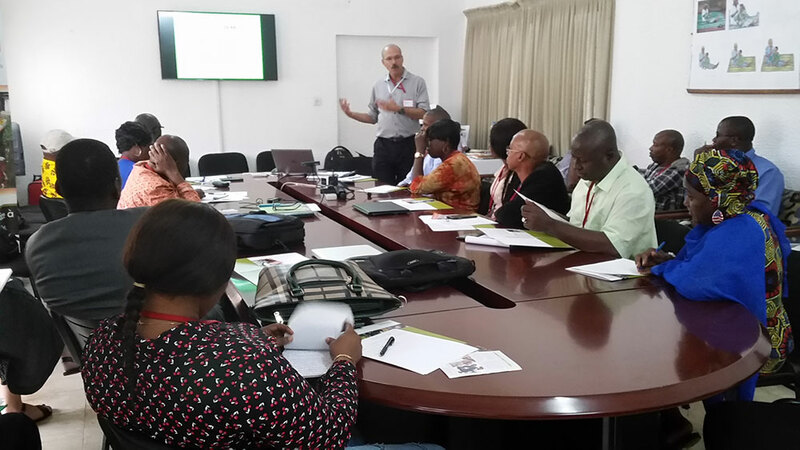 SPRING SBCC Technical Advisor Phil Moses gives details about SPRING and Farm Radio International’s introduction of interactive community radio to promote nutrition-sensitive agriculture practices in Faranah. SPRING displayed examples of illustrations developed by workshop participants for partners to view. 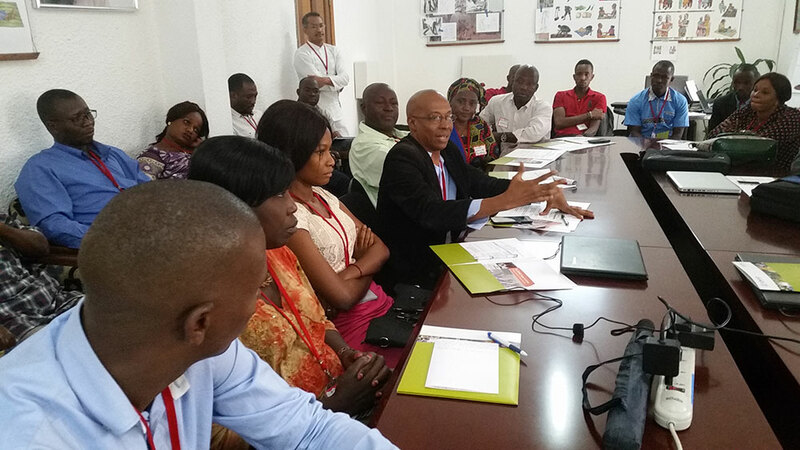 Dr. Mamy Keita, Agriculture Specialist, USAID Guinea, gives opening remarks on SPRING’s SBCC in Guinea. 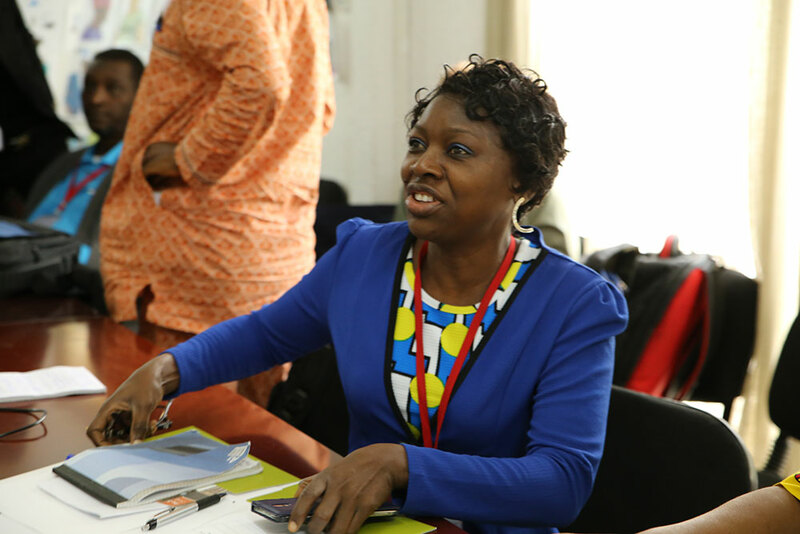 UNICEF’s C4D Officer Miracle Korkalo Saoromou (foreground) and CRS’ Head of Programs Amy Daffé (background). Mme Diaby Sarangbé, Head of Research, Ministry of Agriculture asks a question about community video. 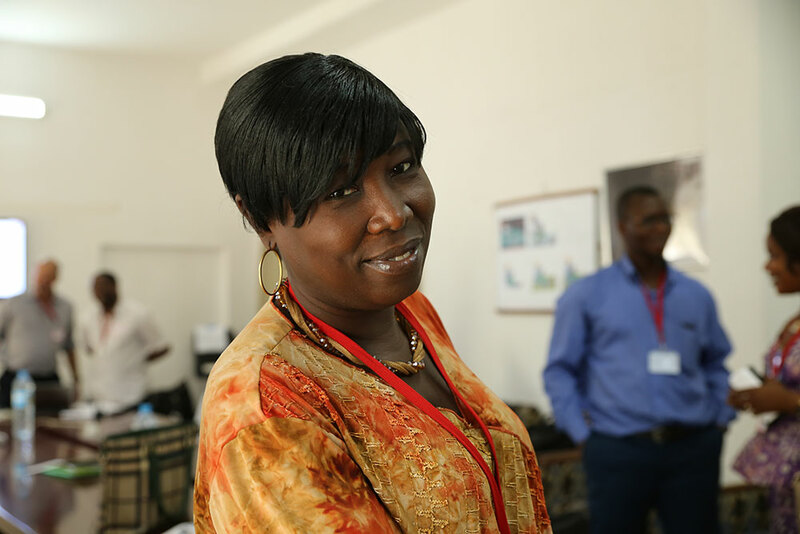 UNICEF’s C4D Officer Miracle Korkalo Saoromou comments on the need for formative research and dialogue in the development of community video programs. 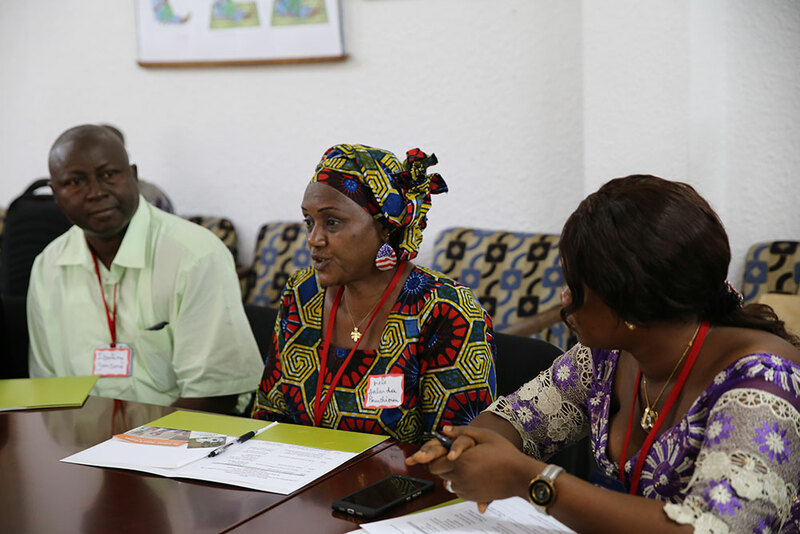 Mme Diaby Sarangbé, Head of Research, Ministry of Agriculture thanked SPRING for the new methods they have introduced.